I'm currently in the process of changing over all of my aluminum or coated baking pans to ceramic or glass ones. Therefore, what could have been a flag-shaped cake decorated like the Stars and Stripes became a round cake with a Fourth theme. Decorate it any way you like with blueberries and strawberries! This is my submission for: This cake is grain free (if you don't use corn starch as a sub), dairy free, and refined sugar-free. Actually,the cake itself is only fruit sweetened, but there are some added sweeteners in the glaze and frosting. Also, be sure to check back at The Spunky Coconut for a roundup of many Fourth of July dish ideas! For the powdered sugar: place 1 cup of coconut/ palm sugar (also works with date sugar- made with finely ground dehydrated dates- both can be found at Whole Foods) in a high powered blender or coffee grinder with 1 Tbsp of corn starch (or, Tapioca starch to be grain free). Store the rest in a sealed container in refrigerator. Preheat oven to 325 degrees F and prepare an 8" or 9" round pan or 8" square pan with parchment paper and grease with coconut oil. For the sprouted quinoa flour, grind sprouted quinoa seeds in a coffee grinder or high powered blender. Then measure after you make it into flour. Sift the sprouted quinoa flour together with the rest of the dry ingredients. Add the wet mixture to the dry, and blend with spatula until combined. Pour batter into cake pan and bake at 325 until toothpick comes out clean, about 20-25 minutes. When the cake comes out of the oven, let it cool for about 10 minutes. Then poke holes about 1" apart all over the cake with a straw. Blend the canned coconut milk together and measure out about 1 cup. Stir in the sweetener. Pour that mixture over the holes (you may only use 1/2 cup at first) and let the cake sit. Then repeat with the rest of the mixture. Let the cake cool for a good 30 minutes until no longer warm to the touch. Now you are ready to ice the cake and decorate. Blend the hard coconut cream (from top of can of coconut milk after it has been refrigerated), vanilla, palm or date powdered sugar**, and melted coconut oil together with a hand mixer or in a blender or food processor. Refrigerate 15-30 minutes to let it firm up. Then top the cake with it. Sprinkle unsweetened coconut flakes on top and then decorate with blueberries and strawberries. For a flag you can place blueberries (cut in half, round side up) in the top left corner and the spaces between them look sort of like diamond "stars". Then make the red stripes by closely putting strawberry slices together, leaving a good space for the white stripes. This cake is very moist, so store in refrigerator until ready to eat. I heart ice cream...or anything ice cream-related. I think this may perhaps be the 5th or so ice cream post I have done since starting this blog in February! Ice cream is my number one favorite food, if you can call it that, hands down. But I don't let my lack of dairy get me down, and I try to keep coming up with new flavors. Our Cuisinart ice cream and fro-yo maker gets its workout at our house. This ice cream is a bit different; it has something sneaky in it ;) A beet. If you are skeptical about taste, let me assure you that the sneaky antioxidant filled veg that is hidden in this ice cream is well hidden! I wish that I had kid testers around sometimes for my recipes. Then I would know if my tricks really work. If you feed this to your kids and they like it, be sure to let me know! Optional: 2 dates (soaked if dry), or you can use honey to sweeten- We think the ice cream is sweet enough with just the cherries and preserves, but feel free to sweeten it up according to your sweet tooth. Honey is a nice complement to beets and cream! Puree all ingredients in a high powered blender (this recipe works best in a Vitamix or Blendtec) so the beet gets finely pureed. For extra richness (optional) add in 2 Tbsp of melted coconut oil to the mixture once everything else is pureed. Freeze according to your ice cream makers instructions. Mine is usually ready in about 20 minutes with no extra freezer time needed. First, yes, if you are one of the people who stops by the actual blog, I have been changing my banner quite a bit. This picture was taken in our backyard where our landlord builds log cabins. I am trying, although very slowly, to change it so it's more "me". We will see if I'm successful, but until then I think I'll leave this one up. I promised some sprouting info in my grains post a while back. If you are not familiar with the wonderfulness that is sprouting, this post is for you. I have dabbled in sprouting in the past. But can now say, I am an avid sprouter, a sprouting advocate (spradvocate ?) if you will. I have been a sprouting, dehydrating, soaking, cooking fool the last couple months, and I'm ready to share with you what I have learned. Basic concept: Sprouting begins the process of germination for a plant. Therefore, when a seed, nut, legume, or grain is soaked, it thinks that it is about to need to reproduce itself. So it begins to break down it's natural protections and begins a metabolic process that makes it more readily nutritious to us. Sprouting and germinating are fairly the same, where the "sprout" means that the seed/ nut/ legume/ grain has successfully germinated. So if you get a little tail when you're done, you have successfully germinated :) For the purposes of this post, I will just refer to a grain, nut, legume as a "seed". Can you see the little tails? Complex carbohydrates are broken down into simple sugars, which are more easily used by our bodies. Complex carbs are also used to make more proteins. Triglycerides are broken down into fatty acids and glycerol, which are more easily assimilated by our bodies. Storage proteins (proteins that seeds/ nuts/ grains/ legumes have that are more difficult to digest) are broken down into amino acids, some of which are changed into essential amino acids, which our bodies need and cannot make on their own. The sprouting process not only does all of these things, but it does something else that is significant. Phytates, or phytic acid, help protect all seeds in the natural world. For example, a wheat berry has an outer phytate covering that protects the seed throughout the digestive tract of an animal (or human) who eats it. If you think about it, it's pretty intelligent design because the seed has the potential to make it through the digestive tract unharmed and land in a pile of fertilizer. Perfect formula for a new wheat plant! However, you can see the implications for us. We cannot readily digest these seeds and grains because our bodies don't naturally break down phytic acid. Luckily, phytic acid is also the storage site, or unit, for minerals in seeds. Therefore, when these seeds begin to grow themselves, AKA: the sprouting/ germinating process, they break down their own phytic acid in order to access their stores of minerals. Great for them (although, they may be eaten before they grow big :), and more importantly, great for us! Not only does the sprouting process break down the phytic barrier, which makes them hard to digest, but it gives us access to more readily available minerals, for example zinc, calcium, iron, and magnesium. Fun fact: a study done of nutrition facts of bread made from both buckwheat and sprouted buckwheat found that the sprouted bread contained 2 times as much calcium, and 1 1/2 times as much magnesium. This was due to the fact that the minerals were not bound up by the phytates. The benefits of sprouting don't end here; but even if they did, one would have good reason to start experimenting with sprouting! There are many more things that sprouting does for the end product, for example makes more fiber. Sprouted flours (made from milled sprouted grains or seeds) taste sweeter as well- so not as much sugar is needed when baking with them. I hope that you will try some sprouting at home. Check out this chart for an idea on how long to soak and then sprout your seeds. But there are many sites out there where I found my how to's. The internet has a wealth of info; eHow is a great starter site. Whole Foods has begun to have sprouted quinoa and legumes in their bulk section. Great idea if you are trying them out for the first time. Local Harvest is a great site to find someone who sprouts locally. I found the To Your Health Sprouted Flour Company through Local Harvest and LOVE their flours. Yesterday, I mentioned that Iris from The Daily Dietribe had issued a Gluten-free Birthday Cake Challenge. This chocolate zucchini cake makes for a sweet moist treat that is not only gluten-free, but dairy-free and refined sugar-free as well. This recipe uses the chocolate version of my Swiss Buttercream. Be sure to check back at The Daily Dietribe for many other fun birthday cake recipes. Heat the oven to 325 degrees F. Line two 8" or 9" cake pans with parchment paper, and grease with coconut oil. Sift all dry ingredients together in a large bowl. Whisk together all wet ingredients and add them to the dry. Bake at 325 F for 20 minutes, or until a toothpick comes out clean. Add all ingredients together, except the melted coconut oil, into a food processor or high powered blender and puree. Then add in the melted coconut oil and blend until incorporated. Store in the refrigerator until ready to fill cake. I used one piping bag with an Ateco 23 (small star shape) tip. I place one layer down and pipe a ring of icing around the outer circle with the piping bag. Then I spread the mousse filling into the circle, smoothed it level with an off-set spatula, and topped it with the other layer top side down (so the flat side is on top). Then I iced the cake and gave it a border. This one is also topped with raw cacao nibs for a bit of a crunch. A short while ago, I was making these: Pounds upon pounds of rich buttercream was made, with much care, in my kitchen. Some was eaten, for quality control of course :), some was slathered on some wedding cake, and eventually some of it found it's way to my hips :) I do miss me some rich creamy buttercream. I have never been an icing girl, well that is until culinary school. My goal for my own frostings was simply that they tasted like ice cream :) I attempted to improve upon a swiss buttercream recipe I learned in school to make it taste like ice cream. And I succeeded. However, I suceeded with butter and white, refined sugar: two things I no longer eat. 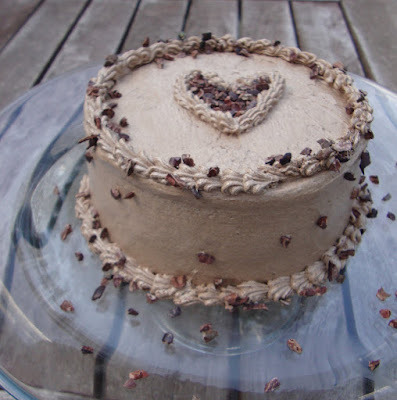 So my journey began to make a dairy-free, refined sugar-free version of Swiss Buttercream. Hopefully, this recipe is just the first of many more like it. I would love to bring you recipes of light whipped healthier goodness! I have been working some ideas for a new buttercream for a while; however, Iris of The Daily Dietribe recently issued a gluten-free birthday cake challenge. I love a good challenge. And for me making this dairy-free, refined sugar-free frosting was a ton of fun, but also quite challenging! I ran into several snafoos- so be sure to read the tips below. Don't let this recipe intimidate, it is actually quite simple if you follow it exactly. Most use the term "buttercream" to mean a variety of frostings- from shorening and powdered confectioners sugar to meringe and butter based frostings. o Swiss (this recipe), which is egg whites and sugar cooked over a water bath and then whipped, butter or shortening is added in once cooled. o Italian, which is pasteurized egg whites and a small amount of sugar whipped to stiff peaks. Then a sugar syrup that has reached at least 235 degrees is slowly added. Then the shortening or butter is added in once the meringue cools. This is the most stable of all buttercream frostings and is ideal for a hot-day wedding! If you get any kind of cake that is pre-decorated with frosting from a store (except Whole Foods- I checked), you will be most likely getting shortening with some form of hydrogenation as an ingredient. This means that the melting point of that fat in your store-bought frosting is most likely 100+ degrees F. I'll let that sink in while I remind you that your body's temperature stays at a cool 98.6 degree F. Eww. Not only is it harder on your body to break down something that it cannot even melt, but it coats your tongue and taste-buds so that you can't taste the goodness of what you are eating! Heat the pot full of water over high heat on stove top until simmering and then cut down to low- this will be the base of your water bath. In the bowl that goes with your stand mixer (as long as it is stainless steel or glass-most are- if not, use a heat-safe bowl), whisk together the egg whites, maple syrup, and sifted coconut sugar. Keep whipping on medium speed until the mixture is fully cooled. Then piece in the shortening by 1 Tbsp at a time while it is whipping on medium speed. The mixture will somewhat curdle and deflate a bit at this point- don't be afraid- keep mixing in the shortening. Once all shortening is incorporated, turn mixer back up to high and mix until you get an aerated fluffy mixture. Optional: you can add 1-2 Tbsp of melted, but cooled- not too hot, bittersweet chocolate at this point to make it a chocolate frosting. Make sure your shortening is right at room temperature- this will help it emulsify better with the meringue. If you get any fat at all in your whites- it won't whip. If you don't think you did, but just to be sure, you can add a small amount of cream of tartar to the whites/sugar mixture just before whipping into the meringue. Also make sure the coconut sugar completely dissolves when cooking over the water bath. If not, your buttercream will have an undesirable grainy texture. This icing does have an interesting maple flavor. If that's not your thing you can try with all coconut sugar; however, I have had mixed results with this. Also more viscous liquid sweeteners like honey and brown rice syrup do not work well because they weigh down the whites preventing a full meringue. After you add in the shortening and begin to whip it back up, it takes a while 10-15 minutes. If you feel like it has been too long (which depending on the humidity and temp of your kitchen this can happen), walk away and get a relaxing drink and then come back and check on it :) I sometimes stand over the mixture nervously thinking- maybe this time will be the time it won't whip up. Trust me- it does come to life :) If you feel like it has been way, way too long- try adding another Tbsp or two of shortening. I love how when something doesn't quite look perfect, you can label it "rustic" and it takes on a whole new identity. Like, "Oh, rustic. That must mean these are an old country family recipe" or "these must have been made from scratch with love". At least, that was what I was going for :) These rolls aren't the prettiest, but they taste good, were definitely made with love, and we do somewhat live on a farm-like estate. Therefore, they seem to have met the "rustic" criteria and get the label Rustic Banana Cinnamon Rolls! Whisk together dry ingredients (first 6) in a medium bowl. Blend together the water, apple cider vinegar, and apple sauce. Once the dough has chilled, get out some extra coconut flour for dusting a large work surface, and roll out the dough out (flouring the rolling pin and work surface generously) to a square foot- 12" x 12". Then make the filling by pureeing the bananas, dates, almond butter, and cinnamon together (if you don't have a good blender or food processor- coarse chop the dates with a chefs knife and add to pureed banana mixed with almond butter and cinnamon). Then (this is different from other recipes that tell you to roll a log and then cut- that doesn't work too well with this dough), cut the dough into 1"-1.5" strips (making sure they are all even, you don't have to be exact these are "rustic" after all :). I usually cut into 9 even pieces. Roll each slice from left to right, using a bench scraper if needed- but should not be if you flowered the surface well. Pan in a 8" x 8" glass baking dish. Bake at 325 degrees for 20-25 minutes. They don't rise a whole lot, just let them get golden brown.